The FLACS standard package can handle explosion, dispersion, ventilation, mitigation and pool modelling. It is also possible to buy or lease individual modules at a significantly lower price than for the FLACS standard package. This module has the capabilities of the FLACS simulator in the areas of dispersion and ventilation, but the explosion capabilities are deactivated. Due to the ability to represent detailed geometries with the distributed porosity concept, the dispersion capabilities of FLACS have proven particularly powerful in calculating release scenarios in process areas where the density of objects and pipes is high. The dispersion models are highly suitable in calculating explosion cloud sizes and use in explosion risk assessments. It has the ability to simulate toxic release scenarios onshore, where representation of terrain and turbulent wind profiles are important. The tool is suitable for companies interested in a well-developed and validated dispersion tool suitable for representing realistic geometry densities efficiently. 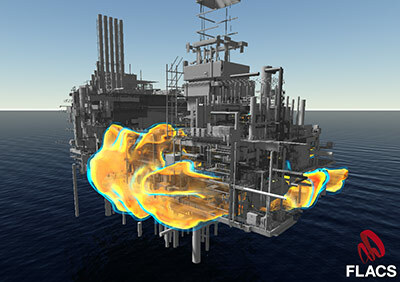 FLACS is the only approved model for the simulation of all LNG vapor dispersion scenarios required for the siting of an onshore LNG facility in the United States. Read more in the article FLACS PHMSA Approval. This module contains the explosion capabilities of the FLACS simulator (i.e not including ventilation and dispersion capabilities). In terms of CFD simulation of gas explosions, none of the competitors to FLACS-Gasex have more extensive capabilities or the same demonstrated validity as FLACS. This module is useful in risk evaluations where hydrogen is used as an energy carrier for nuclear plants, in chemical factories, synthesis gas (gas to liquid processes) and microprocessor factories (Silane SiH4 can be modelled on request). With FLACS-Hydrogen you can simulate and evaluate if a given leak scenario may produce flammable gas clouds, and to what extent the flammable gas cloud represents a risk. Extensive work has significantly improved the validation status of FLACS in simulating hydrogen safety problems. Models for simulation of DDT processes have also been developed. Contact us at ussoftware@gexcon.com for a free demo of FLACS.